When Vodafone decided not to renew their contract with Phones 4u, it left the independent on thin ice with just EE, Virgin Media and their own (EE provided) network LIFE. However, now EE have decided to pull out of the independent retailer, leaving the chain without any of the major networks and making the owners, BC partners, call in the administrators on Monday morning. BC partners have announced that the 720 outlets including 550 standalone stores will not open on the 15th, although the retailer has announced that the 5596 staff will still be paid as normal until further notice. Stores will remain closed until a decision is made if they can reopen. This comes with dreadful timing for those customers who pre-ordered an iPhone 6 over the weekend, although all existing contracts with the retailer will remain unaffected. EE made the decision to pull out 1 year before the end of their contract with the retailer despite making up half of Phones4U’s £1 billion sales, although a decision had been apparently been made not to renew the agreement after September 2015, a strategic review has led to the network pulling out with immediate effect. Why have EE done this? Well, they state that their decision was.. Driven by developments in the marketplace that have called into question the long term viability of the Phones 4U business. They’re also seeking to push further into their own sales through direct channels. Cutting out the middle man seems to be the way forward for networks. This is pretty dire, and I can’t really see a way for the shops to reopen if a network won’t supply them. Having this many high-street stores even trying to sell SIM free wouldn’t really work. Phones 4U boss David Kassler pretty much sums up their situation.. If mobile network operators decline to supply us, we do not have a business. BC partners laid into the mobile networks accusing them of causing a perfectly good business to go into administration with Stefano Quadrio Curzio sayin..
Our overriding concern is for all the dedicated hard-working employees of Phones 4U at a time of uncertainty for the company. Vodafone has acted in exactly the opposite way to what they had consistently indicated to the management of Phones 4U over more than six months. Their behaviour appears to have been designed to inflict the maximum damage to their partner of 15 years, giving Phones 4U no time to develop commercial alternatives. EE’s decision on Friday is surprising in the context of a contract that has more than a year to run and leaves the board with no alternative but to seek the Administrator’s protection in the interests of all its stakeholders. Today is a very sad day for our customers and our staff. A good company making profits of over £100 million, employing thousands of decent people has been forced into administration. The great service we have provided should have guaranteed a strong future, but unfortunately our network partners have decided otherwise. The ultimate result will be less competition, less choice and higher prices for mobile customers in UK. If you’ve ordered a phone with the company they’re telling us that if a handset is marked as dispatched then you’ll receive it. Otherwise, you won’t. As I mentioned earlier, this couldn’t have come at a worse time. They’re probably weighed down with iPhone 6 pre-orders, they’ve got a hugely expensive advertising campaign running and.. all those staff… Thousands of staff now possibly out of a job as we head towards Christmas. Crickey.. let’s hope the administrations can keep it going or perhaps ex-owner John Caudwell could come to the rescue. Either way, even though Phones 4u were profitable, without any networks they simply can’t continue. This is all while Dixons Carphone / Carphone Warehouse is being publicly supported by the networks, Vodafone in particular. Strange. Update – iPhone 6 pre orders are being cancelled and refunded. Update – Ex-owner John Caudwell has publicly slated Vodafone and EE for what they’ve done. Mr Caudwell has hinted that this could well be the end of the company he created.. I don’t believe it can be rescued without one of the networks coming back to the table. Unless the government steps in we’ll be witnessing what was a phenomenal business destroyed by very ruthless behaviour. It seems a shame that a business I spent 20 years of my life growing looks like it could come to such a sticky end. 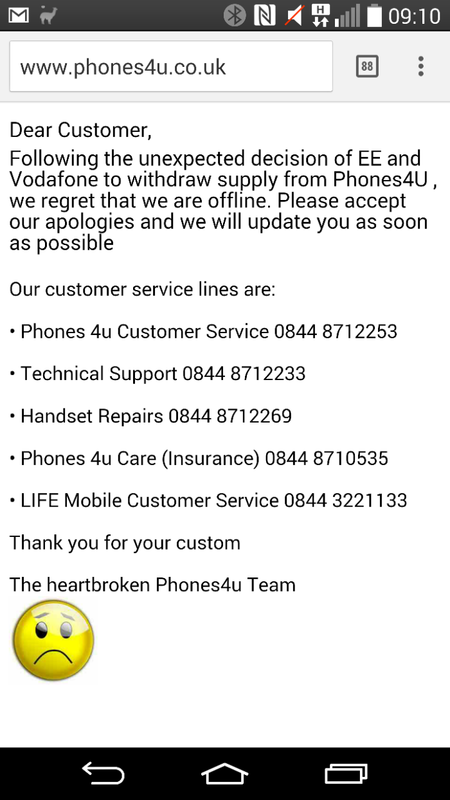 Update – The Phones 4u website is now displaying this heartfelt message, which looks to have been added quickly by a member of staff. Expect this to change when the administrators get their hands on the website . .
Get the full announcement below.. Phones 4u has been informed by EE that it will not be renewing its current contract, due to end 30 September 2015. This decision by EE, which quickly follows a similar recent one by Vodafone, means that Phones 4u is suddenly in a position where it will be without a mobile network partner when the current contracts expires. The unexpected decisions by both Vodafone and EE have come as a complete shock to the business. The company is in a healthy state and both EE and Vodafone had, until very recently, consistently indicated that they saw Phones 4u as a long-term strategic partner. Phones 4u is a profitable, well-managed business with 550 standalone stores, employing 5,596 people. The company has a turnover of over £1 billion, EBITDA of £105 million for 2013 and significant cash in the bank. Phones 4u offers consumers choice, value and an excellent customer experience, which is why it is chosen by mobile purchasers for over one in five of all new connections on the UK high street and it was voted Best Mobile Retailer in 2012 and 2013. However, following the decisions of Vodafone and EE, Phones 4u has no option but to seek the appointment of administrators from PwC. Phones 4u stores will be closed pending a decision by the administrators on whether the business can be reopened for trading. “Today is a very sad day for our customers and our staff. If the mobile network operators decline to supply us, we do not have a business. A good company making profits of over £100 million, employing thousands of decent people has been forced into administration. “Our overriding concern is for all the dedicated hard-working employees of Phones 4u at a time of uncertainty for the company.